Challenge #10: Trim the Tree for $20 or Less! And so, a moment of truth...I am definitely one of the fake tree people (mostly due to allergies). However, I grew up with a fake tree, so it's more sentimental and normal to me to have the same tree year after year anyhow. That being said, I still get excited about decorating the tree every year, just like I did as a kid! Instead of going out and picking a tree with my family, I like to think of a theme and then we all go pick out decorations. It's a small tradition I started in my twenties and carried into my marriage. Some years we just go by the colors we want to use, others we pick an actual theme. This is one of those others years, theme-style. Since my daughter, Jude, is 3½ this Christmas (which is what we choose to celebrate), she is very excited about the magic of Santa! And like me, Jude loves to bake! So, what better theme for our tree than Santa’s milk and cookies?! At our house, Santa gets almond milk, or some other non-dairy milk, because he drinks what Jude drinks! Lol. 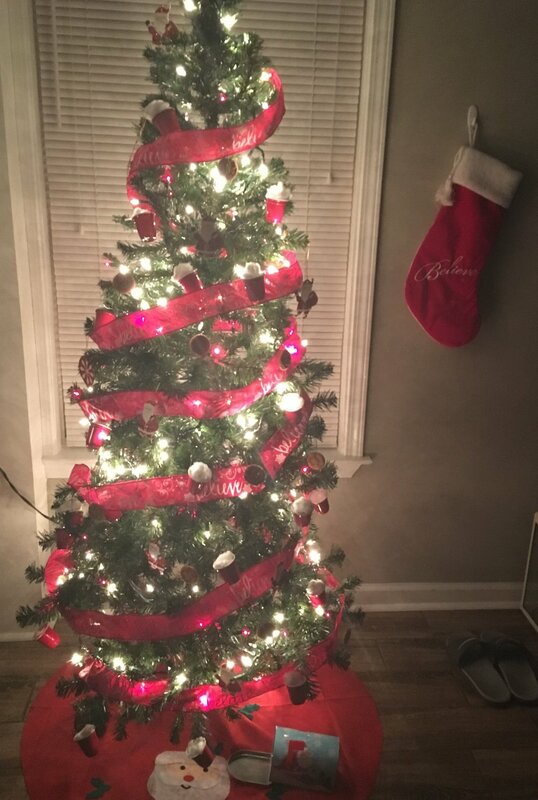 And after thinking about the tree theme, I realized this whole decorating idea would make for an awesome All About the Jack$on$ challenge for the ladies to take on! And so, bring on the decorated trees, ladies…but keep it cheap (wink, wink)!